Other vestigial Brittery abounds, including the usual condescension to Israel. Here's a sentence from the April 10 editorial on the Balkans: "Such outrages the expulsion and mass murder of Kosovar Albanians have happened before--in Bosnia, Rwanda, the Soviet Union, Palestine, and all too many other places, and the ethnic cleansers have got away with their crimes." Palestine? In one English flick of the wrist, the magazine equates the foundation of Israel with Stalin's terror. The Financial Times has been no less egregious. I’ve been following the coverage of Israel by the FT on both its news and editorial pages for years. You can read some of my more recent Spine postings on that subject here, here, here, and here. What’s interesting about the FT on Israel is that its reportage and its opinions are drawn from absolutely identical perspectives, its daily coverage steeped in the same social and cultural biases that animate its utterly subjective and jaundiced views. These views are, then, an inheritance from British imperialism’s impatience with the Jewish insistence that space be made for them, the Jews, in the disentangling of the Ottoman Empire (and specifically in Palestine, where the Jewish nation began). My favorite instance of FT bias is its insistence on calling Tel Aviv the capital of the State of Israel. In this little obsession can be seen the newspaper’s resistance to 61 years of fact that the functioning and symbolic capital is Jerusalem. Its cabinet sits there. Its legislature meets there. Its Supreme Court renders judgment there. Foreign diplomats present their credentials there, however much some of their governments would prefer that ceremonial and official business be done in Tel Aviv. No Christian church--Armenian, Russian Orthodox, Roman Catholic, Coptic, Abyssinian, Anglican, Lutheran, or Mormon--thinks it can do its business with Israel in Tel Aviv. And even the Muslim waqf knows that its grand and routine dealings are to be carried on in the city where David and Solomon reigned. But, if you read the FT, you would think otherwise. OK, the FT is on the Arabisant side of this historic quarrel. But, if it can’t get the most essential facts right, what worth can we assign to its news and views in which complexity and intricacy are the norms? A British group named Just Journalism has just completed a study of last year’s Financial Times editorial coverage of the Arab-Israeli dispute, that century-old conflict between the Jews and Arabs of historic Palestine. Below is a precis of the research. You can read the full report here. There is not a single exaggeration in any of it. As you understand, I’ve been pondering Pearson and its ugly prejudices against Israel for some time. Why is this array of lies, now festering on the British left, still entrenched in one of capitalism’s most trusted publishing companies? I have no response to this urgent query. But I have--actually, just by chance--discovered one possible explanation. Marjorie Scardino, an American who is now the chief executive of Pearson and was for years the head of affairs at The Economist, has a weird association with a weirder charity which also is preoccupied with the long Israeli-Palestinian conflict. It is the Jimmy and Rosalyn Carter Center, on whose credit card the former president travels. It has been supported by so many Arab governments and Arab zillionaires that one can hardly trust its views. But it does have views ... on nearly everything. Still, its opinions on Israel put it near the frontier of crackpots. And, I guess, that’s where Ms. Scardino is also comfy. 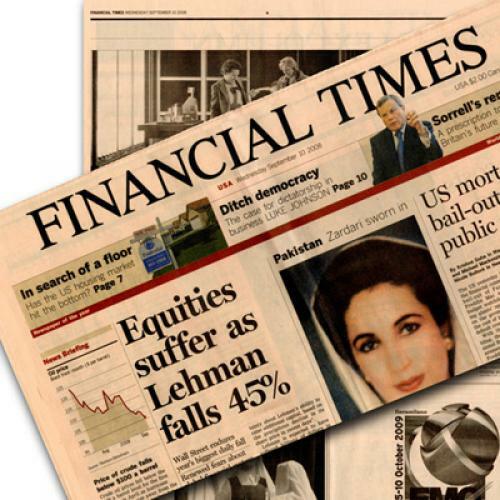 London, UK, 28 January 2010 – Just Journalism today publishes ‘Financial Times 2009: A year of Middle East editorials’. The report is an analysis of 121 editorials published in 2009 in the paper and on its website. It shows that during the course of last year Israel was identified as the main cause of problems in the Middle East. The study shows that threats against Israel’s existence issued by Iranian President Ahmadinejad were ignored in the paper’s editorial column, yet the prospect of an Israeli attack on Iran’s nuclear facilities was referred to on numerous occasions. The FT also downplayed other factors in the conflict such as terrorism and the political split between Hamas in Gaza and Fatah in the West Bank. The report was submitted to the Financial Times for comment but Just Journalism has not yet received a response to the findings.